This is the last of a five-part series on hallyu. ― Ed. For Girls’ Generation fans, the year 2012 must come as an exciting one. Not only are they going to see their favorite hallyu singers on YouTube music videos and K-pop shows, but they are also going to find the girls on the small screen, as TV drama actresses. Speaking of multi-players, Girls’ Generation isn’t alone. Countless K-pop idol stars are making their way into the TV drama scene this year, blurring the boundary between hallyu drama stars and K-pop singers. KBS’ upcoming dance-and-music teen drama “Dream High 2” features popular girl group T-ara’s Jiyeon, boy band 2AM’s Jin-woon, SISTAR’s Hyo-rin and After School’s Kahi. The show is produced by Holym, a joint venture between JYP Entertainment and “Winter Sonata” heartthrob Bae Yong-joon’s agency Keyeast along with CJ E&M. “People should be aware that most K-pop content is being distributed by Japan’s giant record companies, including the Avex Group, not the Korean agencies,” Jang told The Korea Herald. “So the foreign distributors — who usually do a good job as the stars’ PR — take most of the profit, while local agencies of the stars produce press releases that very often overstate about their popularity overseas. Korean media outlets usually publish what they receive from the agencies, and the result is the idolization of K-pop as the major hallyu promoter. The TV drama scene isn’t the only area where K-pop stars are starting to dominate. Girl group T-ara members are currently starring in homegrown musical “Roly Poly,” which is based on their 2011 retro-heavy hit single of the same title. A member from hallyu girl group KARA, Park Gyu-ri, last year starred in the musical “200 Pounds Beauty,” which was performed in theaters in both Korea and Japan. The Japanese edition was a huge success, selling out its first three performances in Osaka back in July. Last year, the Korean adaptation of Austrian musical “Mozart” cast hallyu star group JYJ member Junsu as the leading role. 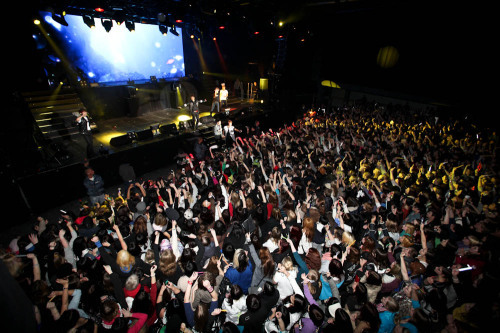 Thomas Drozda, president of the show’s production company United Stages Vienna, visited Korea upon the opening of the show in May last year, and expressed his satisfaction with Junsu’s casting. The K-pop singer, who also appeared in last year’s blockbuster musical “Tears of Heaven” and won numerous rookie musical actor awards, is starring in another upcoming Austrian show “Elisabeth,” which is slated to open in February. EMK Company, the show’s local distributor and production house, said they are expecting a large response from Junsu’s overseas fans. JYJ member Kim Jae-joong made his first appearance in Turkey for a fan meeting Monday. About 600 fans attended the meeting at Ankara University. “As much as to see my fans, I’m here at the invitation by the Korean Culture Service, so I will do my utmost to promote our culture,” the popular singer told his excited fans. His fans sang along to his songs in Korean before surprising him with a belated birthday party. The tickets sold out within 30 minutes on the Korean Culture Service website, reflecting the popularity of hallyu in Turkey. Kim Jae-joong also attended a state dinner Turkish President Abdullah Gul hosted for President Lee Myung-bak at the Presidential Palace later in the day. South Korea will hold a round of quiz games in about 20 nations with questions and answers on the “Korean Wave,” in its latest effort to raise global awareness of Korean pop culture, officials said Monday. In a phenomenon known as the Korean Wave or “Hallyu” in Korean, South Korean TV dramas, movies and pop music had captivated fans in Asia and other parts of the world over the past several years. At present, the Korean government expects a renewed surge of interest thanks to the growing popularity of K-pop bands such as Super Junior and Girls’ Generation. From April to May, South Korean embassies in some 20 nations will hold quizzes on Korean pop culture, titled “Quiz on Korea,” a foreign ministry official said. A winner from each nation will be invited to South Korea to take part in the final round, the official said. “The final round will be held sometimes in July or August,” the official said, adding it will be aired by national public broadcaster KBS. Why is K-pop going to America? Since Girls’ Generation appeared in two major U.S. talk shows and Wonder Girls launched their TeenNick television movie, “The Wonder Girls,” last week, the buzz has been overwhelming. Yet, underneath all the hype lies a question: Why is Korean pop looking to America? “Insofar as America is the world’s biggest music market, we, as a company and for our artists, want to take it on,”said an S,M. Entertainment representative. “If we succeed, it is a market which can earn us massive side benefits,” the representative explained via e-mail. A significant boost in the name value of a musician or group internationally once they achieve success in the U.S. market is an obvious example. For YG Entertainment, the collaborative work with The Black Eyed Peas’ will.i.am on a forthcoming English album is not solely about broaching the U.S. market. “We decided that we need (an official U.S. album) because English is the most effective language to convey the message of 2NE1’s music to overseas fans who want to understand it but who do not know Korean,” said YG Entertainment PR team leader Hwang Min-hee. Right now, S.M. Entertainment’s Girls’ Generation and YG Entertainment’s 2NE1 are still in the fledging stages of entering the American market. After releasing their U.S. debut single “The Boys” last December, the nine-member Girls’ Generation appeared on “The Late Show with David Letterman” and “LIVE! With Kelly Ripa” last week. Meanwhile, 2NE1 started working with will.i.am in 2010 on an album whose release date has yet to be set. JYPE’s Wonder Girls were the first Korean group to make foray into the United States in 2009, touring with Disney Channel-stars, the Jonas Brothers, and made history by being the first Korean act to get on the Billboard Hot 100. The following year, the group launched a 20-show tour in the United States. Last month Wonder Girls launched the original soundtrack single, “The DJ is Mine,” for the TeenNick TV movie in which they star. The first episode of the movie aired last week. “Considering how fragmented the American pop market is, turning attention to the tween market is extremely smart,” St. Michel said in an e-mail interview. Having started off by touring with loved-by-tween hotties, the Jonas Brothers, Wonder Girls is now targeting their market more aggressively with the eponymous TeenNick movie. “More importantly, it treated Wonder Girls like real protagonists,” he added. Girls’ Generation’s U.S. debut single and talk show appearances are, in fact, part of a larger, carefully-planned promotional strategy focused on differentiating themselves from the crowd, according to S.M. Entertainment. “One can confirm the influential power of Girls’ Generation and of our strategy through the group’s appearances on major American television network talk shows,” said the representative. Furthermore, according to the representative, in regards to Girls’ Generation, specifically, the group’s U.S. activity including signing with Interscope Records, is part of a bigger global plan that is primarily focused on Asia, not America. No doubt, Asia is a crucial market for Korean pop, which is why the unprecedented popularity of S.M. Entertainment artists in Europe made headline news last year. Given that, one cannot ignore the possibility of K-pop catching on in a major way in America, and in St. Michel’s opinion it will not be so much about how Korean pop groups like 2NE1 and Girls’ Generation style themselves as it will be about the music. 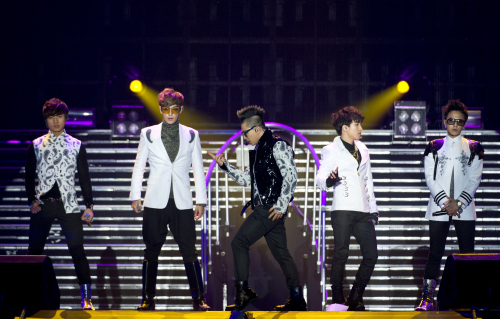 SINGAPORE (AFP) ― Twelve-year-old Sabrina Kaur does not understand the lyrics of her favourite South Korean boy band Big Bang’s songs and, until recently, had never met Koreans in real life. But that did not stop her from joining more than a thousand other Singaporean girls at an audition in the city-state in January to discover a new pan-Asian Korean pop (K-pop) band to be promoted by a talent firm across the region. “I want to be the first Indian (Singaporean) girl to join a Korean girl group,” she quipped moments before stepping into the audition room, outnumbered by aspirants from Singapore’s ethnic Chinese majority. From pre-teens to retirees, millions of fans across Asia have transcended ethnic and age barriers to share a common obsession with South Korean pop music and dramas ― a phenomenon known as the “hallyu” or Korean cultural wave. The industry is now trying to cement its hold on its fan base by creating non-Korean versions of the hugely popular stars and groups idolized by followers worldwide for their striking looks and slick productions. “There is no turning back from here,” Eric Yun, CEO of talent search company Alpha Entertainment Korea, said at the Singapore audition, one of several planned for various Asian capitals. Alpha’s rival S.M. Entertainment ― which boasts South Korea’s biggest female group Girls’ Generation ― recently announced plans to hold similar auditions for pan-Asian K-pop stars in five different countries this year. South Korea’s music industry held its star-studded Mnet Asian Music Awards in Macau in 2010 and in Singapore last Nov., breaking out of its domestic confines to further promote itself. “After Asia, the next step is for Korean culture to conquer the world,” Yun told AFP. 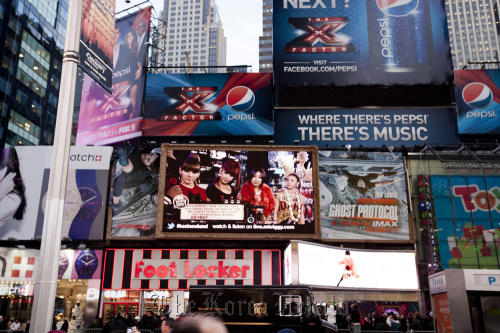 The multi-million dollar-selling K-pop industry has also set its sights on the Western pop world. Girl’s Generation headlined a sold-out K-pop show at Madison Square Garden in New York last year while Google has said it intends to set up a YouTube channel for Korean pop music. Glamorous single-gender K-pop groups like Girls’ Generation, TVXQ, Super Junior and Shinee took the hallyu explosion in the region to the next level. According to a survey conducted by South Korea’s cultural ministry last year, there were an estimated 2.31 million hallyu fans in Asia, based on memberships in official fan clubs alone. Asia has already spawned other pop genres such as Bollywood song-and-dance routines and Hong Kong martial arts flicks, but hallyu is distinct from past fads, according to Singapore-based cinema researcher Liew Kai Khiun. “The spread of Korean popular culture is exceptional as it was not founded upon the traditional factors of military and economic dominance that characterized that of Western imperial powers, or the diaspora networks of India and China,” said Liew, who has been tracking South Korean popular culture for almost a decade. Liew cited the globalisation of American popular culture, which he said went in tandem with the U.S. “imperial expansion” in the 20th century, as an example. However, the jury is still out on whether non-Korean K-pop performers will catch on. “I have to admit that their look is one of the reasons that Thai people like Korean pop stars,” said Chanika Sriadulpun, editor for ‘The Boy Kimji,’ a Thai magazine inspired by K-pop. The phenomenon does have its detractors who take umbrage at what they see as South Korea’s exhibition of soft power. In August last year, thousands of Japanese staged rallies to protest against the Fuji TV network for allegedly “forcing” South Korean programs on its audiences. “We cannot stand the fabrication of a boom any longer,” read one placard held by a protester. In the Philippines, talent manager Chris Cahilig said he was worried that the Korean wave could seriously impede the growth of local talent. He told AFP he was “deeply concerned” that “many of our youth have lost their Filipino identity and psyche due to their exposure and preference” for Korean entertainment. Cahilig said that, compelled to capitalise on the Korean wave in 2010, he put together 1:43, an all-Filipino K-pop-inspired boy band that became an instant hit. The band’s debut album became one of the best-selling in the Philippines the following year. Liew, the Singapore researcher, rejected such worries and said that on the contrary, the K-pop phenomenon has had a positive impact on Asia’s entertainment scene. South Korea’s top girl group T-ara said they could hardly believe their eyes when they were besieged by fans seeking their autographs during a performance tour in Paris early this month. “It was such an amazing experience because all we wished in the past was to rise to the top of a local pop music chart just for once in our lives,” Eunjeong, a member of the group, said during the group’s interview with Yonhap News Agency on Monday. The group, which swept local music charts with their new songs “Roly-Poly,” “Cry Cry” and “Lovey-Dovey” last year, took part in KBS 2TV’s “Music Bank” concert held in Paris on Wednesday last week jointly with other K-pop idol groups such as Girls’ Generation, SHINee and 2PM. “Many people from various European nations such as Britain, Spain and Italy as well as France recognized us when we were in front of the Eiffel Tower for filming. They even knew our songs. I was proud of myself as a K-pop singer as I signed autographs for them and posed in pictures with them,” said Soyeon, another T-ara member. “Some even told me that they like the ‘We’re Married’ show, which surprised me,” Eunjeong said, referring to MBC’s popular entertainment show in which she regularly appears. The girls’ popularity is especially strong in Japan. Last September, T-ara became the first foreign female artist or group in Japan to top the Oricon singles chart in the first week of the release of its debut single “Bo Peep Bo Peep.” Its second single in the country, “YAYAYA,” ranked fourth the same chart. The past 10 months since the group’s domestic release of the retro-heavy hit single Roly-Poly in June has been a whirl of business, with their songs causing a sensational stir both in South Korea and Japan. The group had to carry out busy work schedules, appearing on TV music and entertainment programs, and performing in concerts. Some members even appeared on TV soap dramas and performed at a musical with the same title as Roly-Poly. “Sometimes, I worked 22 hours a day,” the 25-year-old Soyeon said. “It was a really hard time, but we’re happy because a lot of people now recognize us,” she added, smiling brightly. T-ara is scheduled to leave for Japan on Thursday, making their appearance on an SBS TV music program Sunday as their last domestic activities for the time being. While staying in Japan until March 3, the group plans to promote Roly-Poly, their third single to be released in the country. T-ara also faces their first performance in the United States in April. The group will put on a show together with singers and groups that belong to the same entertainment agency as T-ara in San Francisco and L.A., according to the agency. “We’re so thrilled at the prospect of performing in the U.S. We hope to be well known among Americans, too, with this chance as an occasion,” Soyeon said. K-pop artists are looking for opportunities to enter markets outside Asia as competition in the market stiffens. Decreasing album sales due to the popularity of music download and video-sharing sites and the arrival of international pop stars to perform in Asia are leading K-pop stars to look further afield. “They are trying to make money to cover losses from their album sales,” an official at CJ E&M said. “K-pop artists are competing with world stars in the Asian market. So we need to target markets outside of Asia as well,” she added. BIGBANG, a popular boyband in Korea, will travel around the globe to meet their fans starting at the Olympic Gymnastics Hall in Seoul March 2-5. BIGBANG is then set to take their tour to Asia, North and South America, and Europe, performing in 25 cities in 16 countries. “The tour is presented by Live Nation, one of the leading entertainment companies in the world, and the shows are expected to be spectacular in terms of production size and creative direction,” YG Entertainment said in a statement on Tuesday. It will be the first world tour for an Asian artist that Live Nation will have produced and promoted, it added. Internationally renowned director, Laurieann Gibson, has joined the tour as the creative director. Laurieann recently directed Lady Gaga’s “The Monster Ball Tour,” and also worked with other stellar artists such as Shakira, Janet Jackson, Beyonc and Katy Perry, YG said. Boyband BEAST is currently on a world tour. A total of 21 concerts in 14 countries including the United Kingdom, Spain, the United States and Canada are scheduled for the rest of the year. The boy band kicked off its tour in Berlin on Sunday, drawing attention from German media, its agency Cube Entertainment said. T-ara, one of the country’s leading girl groups, also holds their first performance in the United States in April. The group will put on a show with singers and groups that belong to the same entertainment agency, Core Contents Media, in San Francisco and L.A., according to the agency. 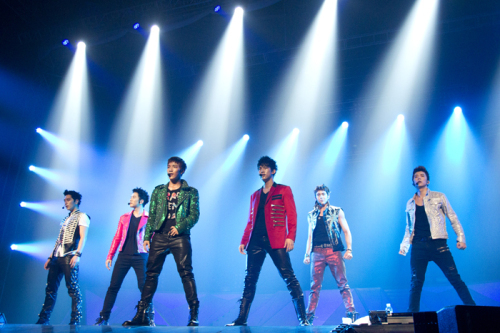 Super Junior and 2PM kicked off their world tour last year. Titled “Super Junior World Tour: Super Show 4,” the 10-member group, which performed in Osaka in December and in Taipai two weeks ago, plans to hold concerts in Singapore on Feb. 18-19. Schedules have yet to be confirmed, but they are to visit cities in Europe and South America as well, according to reports. Starting in September last year, 2PM performed for fans in Taiwan, Jakarta and Singapore. The boy band continues its Asian tour titled “2PM Hands Up Asia Tour Concert” in Bangkok on Feb. 18, Nanjing on Feb. 25 and to Hong Kong on March 10. About 27,000 tickets for 2PM concerts to be held in the three Asian cities are already sold out. Ticket prices about 100,000 won, almost the same as those charged for concerts held in Korea.